Apart from clouds being a natural phenomenon, they tend to add beauty to the atmosphere and make the weather pleasant. Depending upon the atmosphere, clouds take different forms and shapes and can be identified from their salient features. Overall, clouds are divided into low level, medium level, high level, storm and vertically developed clouds. The groups are named in Latin that describes their overall appearance. The clouds that are formed at a low level are lumpy along with layers that produce drizzle or rain. The most popular low level clouds are called stratocumulus clouds. This type of clouds are further classified into stratocumulus duplicatus, stratocumulus castellanus, stratocumulus lacunosus, stratocumulus floccus, stratocumulus undulates, stratocumulus translucidus, stratocumulus radiates, stratocumulus praecipitatio, stratocumulus perlucidus, stratocumulus opacus, stratocumulus mammatus and stratocumulus lenticularis. What are stratocumulus lacunosus clouds? The stratocumulus lacunosus look very similar to a loose honeycomb. It has some layers of rough gaps that are surrounded by cloud fringes. Such type of cloud formation can appear at any cloud level. However, the lower level clouds are known as stratocumulus lacunosus clouds. How are stratocumulus lacunosus clouds formed? Stratocumulus lacunosus clouds are formed when the water vapors from oceans, rivers, lakes and ponds rises upwards into the sky. The vapors are then attached to the condensation nuclei. As soon as the condensation nuclei become large, it becomes a visible cloud. 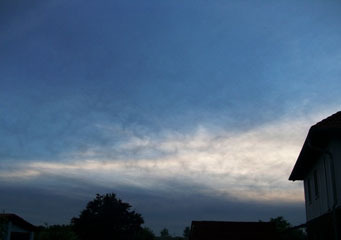 On the whole, stratocumulus lacunosus clouds are formed when moist conditions are prevailing. They can be considered as an indicator of stormy weather. If stratocumulus lacunosus clouds are in layers, then it can lead to moderate or light precipitation. What height are stratocumulus lacunosus clouds found? As mentioned earlier, the stratocumulus lacunosus are low level clouds. They are usually formed quite near to the base area and are not higher than sixty five hundred feet above ground level. Their height can vary depending on the weather conditions prevailing at the moment but usually they are formed at a low level. How high stratocumulus lacunosus clouds can get depends on a number of factors. They have a strong link with the intensity of precipitation as well. What do stratocumulus lacunosus look like? Stratocumulus lacunosus clouds can be easily identified form their unique shape. They have a different style of gaps between clouds and you will see some regular holes in them. These holes are formed because of the sinking pockets of air. In these clouds, the cold air finds itself over the warm air. Since cold air is denser than the warmer one, it tends to sink down through the warmer air. How common are stratocumulus lacunosus clouds?